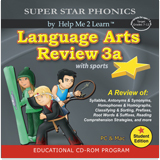 Designed as a review for remedial and at-risk students, Language Arts Review 3a uses young adult characters and sports games to engage students in fundamental language arts skills. The techniques will help older students and adults improve their reading and comprehension and have a great time doing it. Language Arts Review 3a may be used as an alternative to Phonics 3a for wider grade levels. It features the Gold Medal Motivational and Data Tracking system, which encourages students to earn bronze, silver, and gold medals by completing each lesson. Want To Tell A Friend About Language Arts Review 3a!! !